For the third year in a row Gateway Bible Church (my home church) has sponsored a conference for Pastors and church leaders in both the city of Santa Cruz and the mountain town of Samaipata, Bolivia. This opportunity has come about at the request of Pastor Matias Mojicas Sr. who serves as the pastor of Bible Baptist Church in Santa Cruz, a church that he started many years ago. Over the years, Pastor Matias has seen churches start in many places around the Santa Cruz area and now serves to oversee and care for the pastors serving in those churches. Two years ago, on our first trip, we sought to understand what kind of training would be most helpful to the pastors. After ministering in their churches, hosting a conference on Preaching and spending a few hours in discussion with the pastors in that area we settled on hosting Practical Preaching Workshops following the pattern of the Charles Simeon Trust training workshops. Instruction – 6-9 sessions on principles of exegesis and understanding and applying the text. During these sessions we want to teach the attendees to be like detectives in seeking to understand the structure, emphasis, central theme and aim of the text. Model Preaching – 2-3 sermons are preached by the instructors and/or host pastors as examples of expository preaching followed by purposeful and extensive questions and answers regarding structure, emphasis and ideas. It is not often that pastors can help one another by discussing and evaluating their sermons. Here is Pastor Matias faithfully preaching from 2 Timothy 4:1-8. Workshops – 4-5 small group sessions where those in attendance work together on an assigned passage of Scripture under the guidance of a group leader. The participants work through six questions about the text that will result gaining the structure, emphasis and central theme of the text as well as seeing how the text connects to the gospel. This information is the skeleton necessary for developing a faithful expositional sermon. Both Pastor Matias Mojica Sr. and his son, Matias Jr. were an integral part of the conferences by sharing in the translation as well as in helping guide the attendees in the small groups. Without their passion and love for these pastors this ministry would not be so effective. 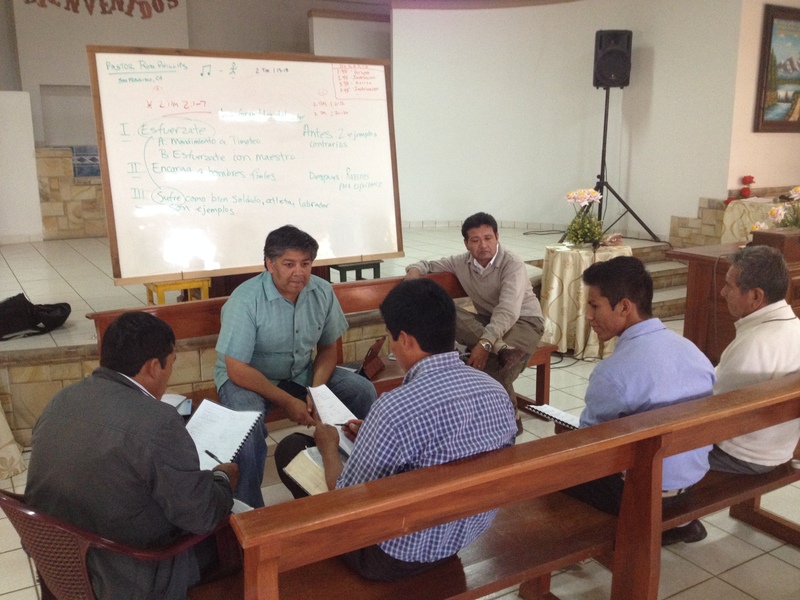 They are the backbone for the future of faithful expository ministry in the Santa Cruz region of Bolivia. Please pray for them. We were thankful to have over 35 attendees attend the Santa Cruz conference held at Bible Baptist Church and over 15 in the mountain town of Samaipata.